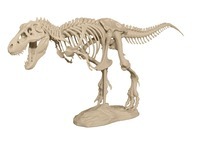 T-Rex Skeleton by MakerBot is licensed under the Creative Commons - Attribution - Non-Commercial - Share Alike license. The T-Rex model is a great educational tool that's 20 times smaller than the real-life skeleton of the mighty Tyrannosaurus Rex. Whether you're using it in the classroom or adding it your collection, you'll take pride in knowing it's built accurately to scale. From tail to teeth, this carnivore is created exactly in the image of its ancestor. No details were spared, from its intricate skull, to its delicate ribcage, to its laughably small arms. This lizard king is at home in the classroom as well as in a dinophile's collection. 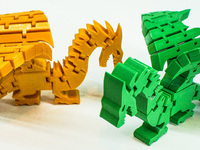 Simple to print with PDF assembly instructions, T-Rex is a unique addition for all kinds of lesson plans and other fun uses.